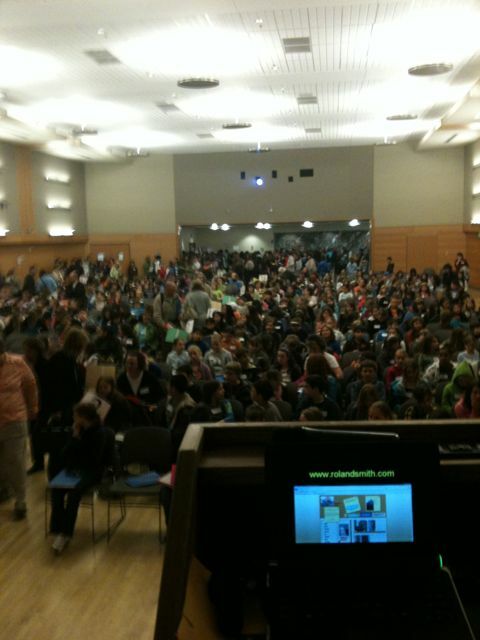 I spoke at the Oregon Writing Festival today, for what I think is my 3rd time to 400 young writers. It’s a tremendous event sponsored by the Oregon Council of Teachers of English (OCTE) headed up by my old friend Rick Hardt. Young writers from all over the state descend upon the Portland State University campus for the day to talk about and share their writing. After I spoke I got a chance listen to some of their writing and it was very impressive. I’m going to have to stay sharp to keep up with their skills. All of them write better than I was at their age. There are going to be a lot of great novels, short stories, and poems coming from these Oregonians. You were great to listen to you were so funny i was sad when ididn’t have time to get an autograph. I’m sorry you didn’t get an autograph. I am a 5th grade teacher in Corvallis and I had a student who attended the conference. I drove up to hear you speak; which was wonderful. My student and I talked about revision a lot this week to our entire class. You made me even more excited to teach writing. I loved when you said,”Inspiration does not cause writing but writing causes inspiration.” It is so true and I definately see that in my students. When we read good writers, we get excited to write like them or find more of our voices. Thank you for sharing your wisdom. It was a pleasure. Believe me. The pleasure was all mine.